I saw this pudgy little fellow on the Beltline west of the Dufferin Street pedestrian bridge today on my bike ride. Gosh! I love spring!!! Later on I saw a man walking his bunny in the park. Life is good! I really wish I’d brought a better camera with me on my bike ride. I took the picture with my cellphone so that explains the general lousiness of the photo. The screen is so tiny I couldn’t figure out if I took a decent picture of the groundhog, or not. It’s a “not”, isn’t it? I better juice up the rechargeable batteries in my point and shoot camera RIGHT NOW. I had a fun Good Friday. 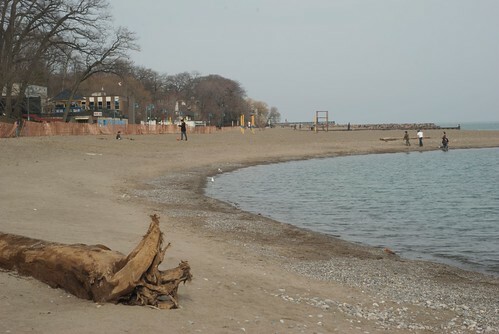 Lunch at Swatow’s, iced Doubleshot at Starbucks’ (or Starbies as I like to call it — I’ve spent enough money there to feel like I’m entitled to give the place a nickname), then a quick streetcar ride to the Beaches where I bought the worst tasting bag of chips I’ve ever eaten. The SBC (Sweet Baby Cat — again, he’s my favourite person on the planet, I feel I can refer to him with my very own special nickname) stopped into the Nutty Chocolatier on Queen East to look around and breath in the heady chocolate fumes. The shop also stocks plenty of British brands of snacks, chocolate bars, biscuits, baked beans, and crisps (chips to the average North American. Just to be confusing, the Brits refer to french fries as chips. I don’t know what french fries mean to the British — sunburned French people? Naw, I hear there’s not enough sunshine in England for a sunburn.). Unwisely, I decided to buy a bag of crisps that were on display. Unwisely only because the flavours on sale were part of some contest being held by Walkers’, so there was not a single bag of cheese and onion — how cruel. How can I describe the flavour? Some chips had a malt vinegar and salt flavour (well, duh) and others were fried fish tasting (again, duh), but the off putting chips were the ones that tasted like batter. 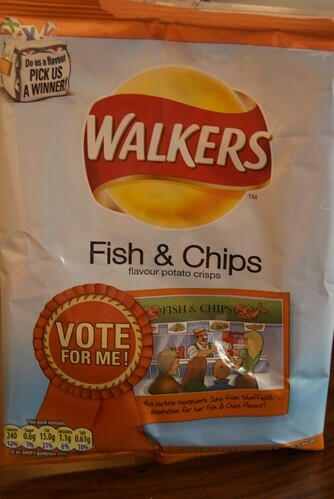 The problem was on their own the chips flavoured crisps were good, the fish flavoured crisps were a bit too fishy but not unexpected, it was the bland batter crisps that added a weird tone that overwhelmed me since there seemed so much more of them than either the chips or fish flavours. It was like eating a bag of cold batter. During and after sharing the crisps with SBC all I could think was “I should’ve bought the Cajun Squirrel flavour”. At least I have no idea what squirrel tastes like, and Cajun would probably have been the dominate seasoning anyway, and I like Cajun. Next time, squirrel. Here’s a bonus photo of Toronto yesterday. 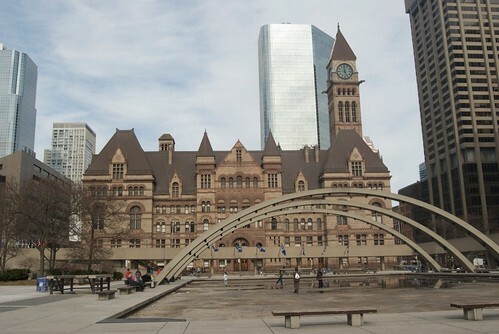 It’s Old City Hall taken behind the rink/fountain at Nathan Philips’ Square (or new city hall — but no one calls it that). Aw heck, here’s a photo of Nathan Philips Square I also took yesterday. 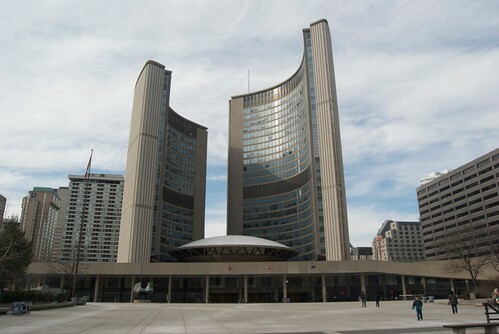 Just so you can compare it to Old City Hall above. The architecture is quite different, yet the size of the square sets NPS off to the side and above it so you don’t sit there and go “huh, they don’t look alike or match”. This way the two styles don’t mock one another and we’re constantly comparing them. Now, go enjoy your Easter weekend. Eat chocolate and don’t touch the fish and chips flavoured crisps. Think cajun squirrel!! So this is the first batch of Easter eggs I’ve ever dyed. And I mean on my own, rather than say the eggs I dyed as a kid with supervision from a mature adult. They’re not bad. I am missing some kind of dying trick because they are rather pale eggs. I followed the directions on the box of dyes and this is what I got. I did check Martha Stewart’s site but I have to admit that decoupaging my eggs held no attraction. 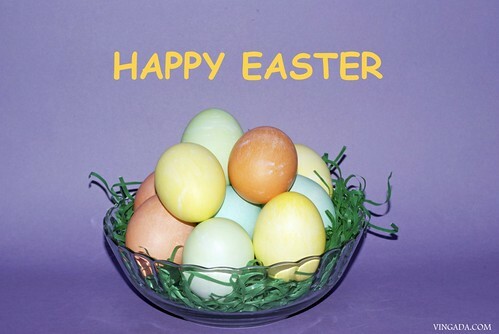 Neither did wrapping up the eggs in lace before dropping them in dye. Or onion skins. And I definitely don’t have the patience to go the hot wax and stylus route. Nope, simple swim in the dye it was. Still, I’m impressed with myself. 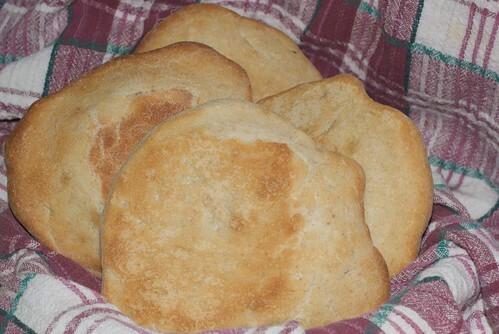 Today I felt like eating warm, home baked bread. I also wanted the bread to be soft and fluffy, but flat similar to a pita so I can save the rest of the uneaten bread for lunch. Bread is easy to make. I started with 1 cup of warm water, 1 teaspoon of yeast, 1 teaspoon of honey, and 1 cup of flour (I used a blend of whole wheat and white). Stir all together in a bowl. Let sit for half an hour. I let my handy dandy Kitchenaid mixer to do the hard work for me. I use this spare time to fan myself and drink Tom Collins. So, I put the mixing bowl onto the Kitchenaid and added 1 teaspoon of salt, another cup of flour, and started the mixer. When the flour is incorporated I turn off the spinning dough hook (very important if you want to unbroken fingers) and check to see how wet the dough is so far. I wanted a moist dough so the bread would have a rustic holey kind of texture. The dough was sticky and wet — too sticky and wet so I added 1/4 cup of flour and turned the dough hook on again. Now and then I’ll check the dough to see if it’s the way I want, and add an extra 1/4 of flour. Basically it’s still sticky but elastic. If I was making pizza dough I would add more flour until the dough was smooth and elastic. I prepared a bowl to hold the dough while it rises. I rubbed a teaspoon of olive oil inside the bowl and flopped in the dough, then covered it with some plastic wrap. I left it for about a couple of hours. Two hours later I punched down the puffy dough with my flour covered hands and took the dough to my clean kitchen counter. The counter has 1/4 cup of flour on it and I knead the dough with my hands for about 10 minutes, adding extra flour to make kneading easier. I then cut the dough into quarters, flattened the chunks until the circle measured about 5 to 6 inches across. With plenty of flour on both sides of the circles I let them rest for another 30 minutes. Pre heat the oven to 500 fahrenheit and spend the next 30 minutes scrapping up all of the leftover flour, washing the mixing bowl, putting away the mixer, wondering why the devil I just don’t buy bread like normal people, and why I didn’t start the clean up two and a half hours earlier. I calm down and put the circles on a baking sheet and put it in the oven. Cooking takes about 10 to 15 minutes. The loaves puff up and turn golden brown. I flip them over so they turn colour some more after the tops look golden. Take the beauties out of the oven and let them cool. But I usually tear into the first victim armed with butter. It was so delicious it brought tears to my eyes! And they make excellent rolls for a hearty lunch. I split the dough into 4 large 5 inch or so in diameter and that makes rather puffy loaves. You can make one large flat loaf, or split the dough into 6s or 8s and stretch the dough into thinner circles. I wouldn’t try using this recipe for a traditional bread loaf because the density makes the bread rather chewy. Think jaw cramping. But damn tasty! The majority of the snow has melted. The Don and Humber rivers are flowing like mad towards the lake. I rode my bike a full month earlier than last year, and exactly 4 months after putting my bike away for winter. I’ve racked up 90 km already. 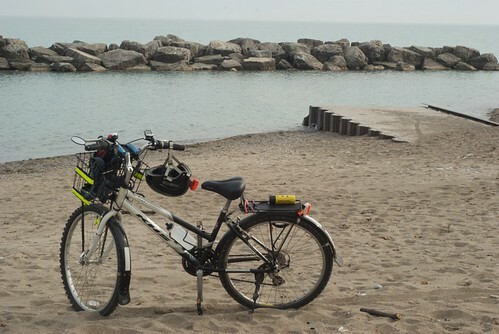 This past Sunday I rode to the beach in the east end of Toronto and remembered to bring along my camera. My bike on the beach. The beach was full of people on Sunday because it was sunny the entire afternoon and about 9 degrees celsius. 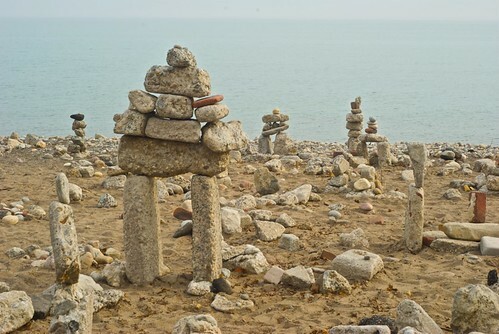 It was busier on the western edge of the beaches between Woodbine and Ashbridge’s Bay. I hope spring continues to get milder and milder as we get closer to June. Winter. I hate it. I have such a hard time being interesting or interested in the world around me from November thru March. That’s why I haven’t written much here lately. Sorry but snow, gale speed winds, snow, and ice covered sidewalks, and snow really do a number on my creative forces. I took this picture with my Lomo Fish Eye camera. And once again – if you want to upload a lomography photo to your computer you need to ask the photo developer store to burn your photos onto a cd. (In fact, you may save a few dollars if you burn the photos rather than print them. I don’t bother printing anymore. Only the really really good shots that I want to frame.) Then just pop the cd into your computer and copy to whatever photo library app you use. I have an Apple computer so I use iphoto. It’s easy! First off, I’m thinking about taking a digital photography class sometime this summer. 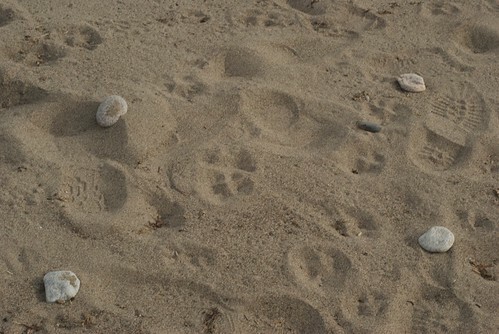 I quite thoroughly adore my Nikon D40X and want to take better, more creative photos. And my Flickr account is looking kind of bare so I should head out once the thermometer is showing temps on the plus side. I also need to work on my Photoshop Element skills — they are seriously weak. One big BIG advantage about taking a photo class at a college is I can get a student card and then purchase the real live honest to goshness Photoshop with curves, levels and rendering for a song. I am looking incredibly forward to riding my bike. Oh my God! I miss bike riding!! My poor bike looks more like a coat and towel rack with the sweaters, hats, quick dry towels I use for swimming covering her sweet Shimano geared frame. And her tires are flat, the chain needs lubing, the brakes adjusting, and a general going over with my allen key collection to tighten all of her bolts. Then I will ride like the wind! Not much of a wind since I haven’t ridden since November turned into one of the snowiest Novembers in living history. So, it also looks like I will have to cut back on Starbucks Apple Fritters (mmmm, donuts – just typing that makes me drool) and start walking up stairs instead of looking for an elevator or escalator. Cats have been high on my mind the last few months. My mom’s cats Freddy and Belle make me laugh hysterically whenever I visit. I bought them catnip and a couple of paperbags and had much fun watching Freddy enjoy his cat high while destroying a Whole Foods bag. The Freddle takes much pride in his destruction prowess. You can see him measure up a bag or a box and watch as he decides just how he will render it into a pile of paper shreds. Freddie versus Bag. My money is on Freddie. My best friend Jane suffered a terrible blow this January. Her beloved cat Whitney passed away at the age of 14. She was a great kitty. Whitney was truly a regal cat – she was a lovely deep black colour and she adored sleeping on her mom’s pillow. I got to babysit her a couple of times and she ignored me in a truly elegant manner. Her sister Jasmine has been doing her best to comfort Jane this past while. Jazzie is a truly bonkers cat — she has a great and terrifying hiss, and her fangs sink deep and hard into any annoying fleshy parts that pat her too much. Hey, I was warned. And my thumb is better now. I went with Jane to the vet with Jasmine a couple of weeks ago. Jazzie needed her vaccinations and a general check up. She hissed like a demon cat and wouldn’t let the vet and technician examine her. They did manage to give her the vaccine shots but that was it. Yeah, she’s pretty fierce. Jane and I had a great afternoon and we managed to ignore the furious hissing cat sitting in the back seat of the cat. 1) Questionable Content. Is a great webcomic by Jeph Jacques featuring a fantastic cast of characters. I love their misadventures and I love Pint-size the very naughty robot. 3) Starbucks apple fritters! Oh my goshness, they are deep fried delicious apple, sugary, frost dripped bundles of fatty happy goodness. And I have to give them up so I can fit in my bike shorts… crummy stupid tight shorts. 4) My terrible and inept attempts at vegetarianism. I can’t call myself a vegetarian by any stretch of anyone’s imagination. But I’m going to try — how about a carnivorous vegetarian? No? Well, it’s constant work. I started really well in late September of 2008, had one lapse in October (Chipotle’s Carnita burrito, who could blame me? ), did really well in November, December, and most of January. But failed miserably in February. I’m pretty sure a solid 2 weeks worth of steak and burgers knocks me out of the Vegetarian Club (if there’s one, I don’t know). I will try harder from now on. Just have to keep out of Chipotle and South Side Burger (oh heavens!). Here is a nice series of photos I want to share with you. But don’t tell my mom, she hates these photos. I love them! Mom holding up Freddie. I don't think he likes this. Freddie is soooo going to lose it. Heh heh heh! Oh God! That cracks me up every time I look at that shot. I took the photos with my cell phone (2 megapixels, not too bad) and I was completely involved with holding the phone steady and didn’t realize that Freddy was tired of posing. He went nuts and started savaging my mom. I have never laughed so hard in my life! But don’t put any of it in your mouth. It’s made out of boiled hooves and tendons. Oh, and spammers? Do you really think I’m going to approve your crappy comments? Your ridiculous insurances offers and jibberish only make me want to send your details to other scammers. If you do then I have a couple of bridges and some prime property on Mars for you. But this is a time limited offer! How Can Such a Sweet Cat be so bad? Freddy is my mom’s cat and she tells me all the time how ferocious he is. She claims he bites, scratches, and generally mauls her several times a day. What mom doesn’t say is how she loves to tease and tickle him until he responds with many bites and those swell kangaroo cat kicks. Ouch, but I can’t offer up much sympathy since she provokes it and actually enjoys the rough play. Fortunately so does Freddy. Now, I’ve never experienced this from Freddy. When I come over it’s love and kisses and he curls up on my lap for a nap and cuddles. He is incredibly friendly and loves having his head rubbed and kissed. We get along just fine. Several weeks ago I visited my mom and the cats (she also has a rather cranky Tabby named Belle who hates my very existence). My mom decided to rough house with Freddy while I snapped away. I’m going to print this photo and frame it for my mom.